Notice: Alona Palm Beach Resort has been acquired by the Boracay Regency Group of Resorts, also known as Henann Resorts, owner and operator of Boracay Regency, Boracay Garden Resort and Regency Lagoon, and has been renamed Henann Resort Alona Beach, and was re-opened on March 15, 2011. We will be adding more information when it becomes available. 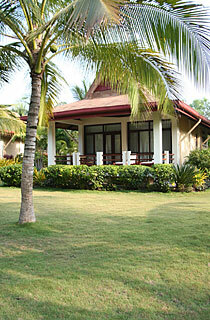 This widely spaced out resort has a number of luxury bungalows around a peaceful garden. 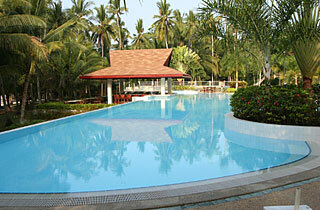 The restaurant is near the magnificent 'infinite' swimming pool, which appears to seamlessly merge with the sea. 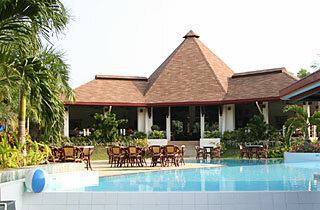 The swimming pool with bar. One of the luxury bungalows.